Door holding hardware allows people and material to be moved through the opening without the worry of the door closing and needing to be reopened constantly. Areas where a hold open function is often used include storage rooms, exterior entry doors, stairwell doors, classroom doors, and corridors. High usage of door hardware will require more frequent maintenance and replacement. Using door holders can help prolong the life of other hardware used at the opening. Holding open a door can be accomplished with various methods. We will discuss several hold open hardware options to control the door as required. Most hold open devices are used on openings where closers are installed as well. If an opening has a fire rating, hold open devices are not to be used unless approved by the appropriate codes or the authority having jurisdiction. Door holders can be manually operated, requiring a person to place the hardware in the holding position. Other door hardware will automatically hold the door when the door is opened to a certain point where the hardware engages and holds the door. 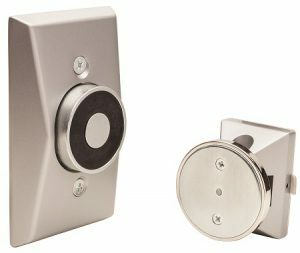 Finally, there are electromagnetic door holders that are electrically powered and tied into the fire alarm system. Each type of hold open device (manual, automatic, and electromagnetic) can be mounted at the opening in a couple of ways. They can be mounted to the wall, to the floor, or mounted overhead to the door and frame. Door holders that require manual operation include floor mounted stops and wall mounted stops with added hold open hardware. These are the simplest way to hold open the door. They have a hook that attaches to a strike attached to the door and must be manually hooked together. Kick-down holders are mounted to the door with a movable arm that can be “kicked” down to grip the floor and hold the door open. Kick-down holders are not recommended because they can conflict with ADA requirements. 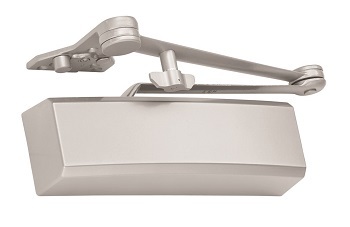 Commercial door closers with hold open arms are mounted overhead to the frame and door. They are manually operated to hold the door in the open position. 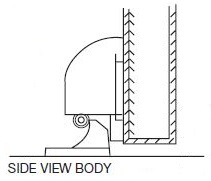 Closer arms can have a friction hold open joint that can be set to hold the door at a certain degree of opening. Other closer arms have a thumb-turn and ball catch like those on LCN closers with HCUSH and SHCUSH arms. 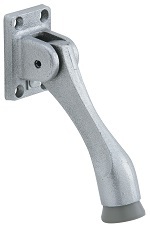 Overhead stop and hold open hardware is also available without requiring a closer. 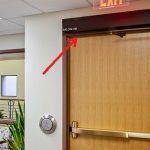 Glynn-Johnson offers a number of overhead stops that have hold open functions built into them. Door holders that are automatic just require a person to open the door until it comes in contact with the hold open device. 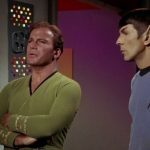 The hardware will engage and hold the door open. A simple pull on the door will cause the hardware to disengage allowing the door to be closed. 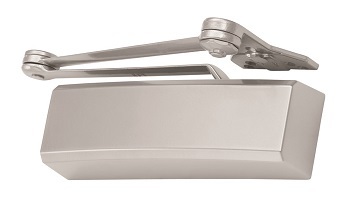 These automatic door holders can be floor mounted or wall mounted. 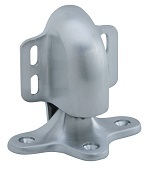 Also known as “Mag Hold Open” devices, electromagnetic door holders are available for floor or wall mounting. A small metal plate is attached to the door and is positioned to come in direct contact with the electromagnet. When energized, the electromagnet will hold onto the metal plate to hold the door open. 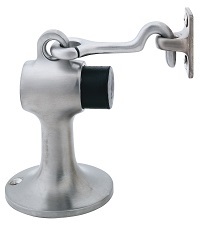 Mag hold open devices are connected to the fire alarm system or life safety system. In an emergency, the magnet will receive a signal to deactivate which releases the metal plate allowing the door closer to close the door. These devices are often used on openings where there is high traffic but the opening must also be closed in an event to act as a secure barrier. People often confuse Electromagnetic Door Holders with Electromagnetic Locks. These are not the same! Electromagnetic holders hold the doors open while electromagnetic locks hold the doors closed and they look much different.